Konami announced its financial result for the fiscal year ended on March 31st, and they’re definitely strong, showing growth for the gaming business. 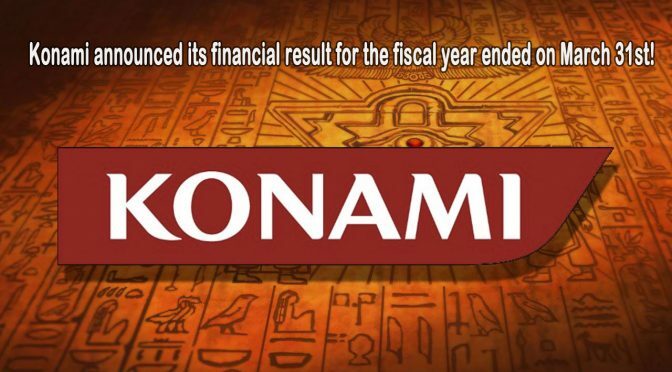 Konami released today its financial results for the fiscal year ended on March 31st, 2018. As you can see below, all the figures are in the black, showing significant improvement year-on-year. 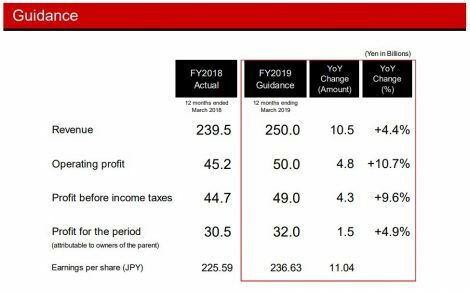 Operating profit showcased a 24.3% increase, The publisher pretty much met its forecasts, missing the revenue prediction by 0.5 billion yen, and overperforming on the operating profit side by 0.2 billion yen. The tables below shows revenue and profit figures split by segment. 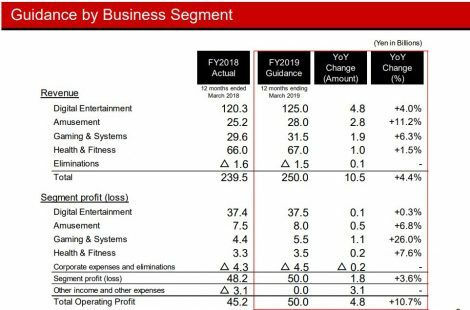 The Digital Entertainment business (which includes games, as the “Gaming and Systems” segment is actually related to arcade and pachinko machines) is carrying the day for revenue, showing the biggest sales and being the only one displaying improvement. It also showcased the largest profit. Konami also announced its forecast for the current fiscal year, ending on March 31st, 2019. 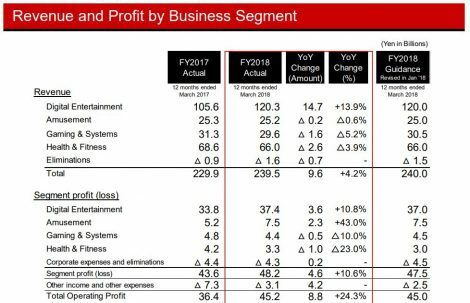 According to the publisher, both revenue and profit will keep growing both in general and for the Digital Entertainment business. The press release also included an explanation of the results. The publisher mentions “functional enhancement” for both mobile and consoles. 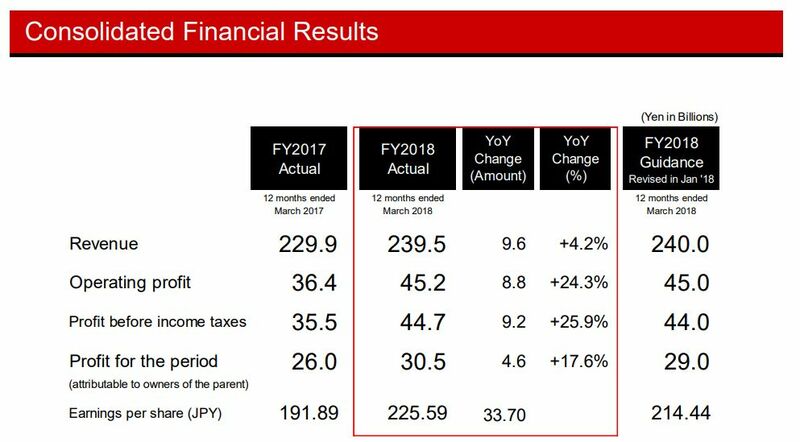 “For the fiscal year ended March 31, 2018, the Japanese economy remained strong with improvement in corporate earnings and the labor environment and recovery in consumer spending. While overseas economies are also gradually recovering, the future remains uncertain because of concerns about political and policy movements and a heightening of geopolitical risks. 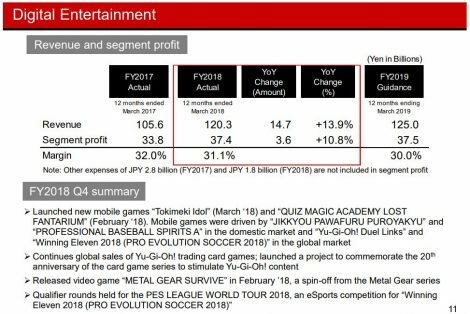 Pro Evolution Soccer 2018 is enjoying stable performance, but there is no specific comment on the sales of Metal Gear Survive, which you may interpret as you wish. “In terms of the mobile games in the Digital Entertainment segment, we released two titles of Tokimeki Idol and Quiz Magic Academy LOST FANTARIUM in the domestic market during the three-month period ended March 31, 2018. Other mobile game titles also continued to enjoy strong performance, including JIKKYOU PAWAFURU PUROYAKYU, Yu-Gi-Oh! DUEL LINKS and PROFESSIONAL BASEBALL SPIRITS A (Ace). As for card games, the Yu-Gi-Oh! TRADING CARD GAME series continued to develop in the global market. One year has passed since the introduction of the new rules in March 2017, which have become more known to customers. A further piece of information is provided about the forecast for the coming year, mentioning “favorable reviews” for Jikkyou Powerful Pro Baseball for PS4 and PS Vita, and the upcoming release of Super Bomberman R for PS4, Xbox One, and PC. Last, but not least, the publisher is “eagerly working” on Zone of the Enders: The 2nd Runner M∀RS, that has recently been delayed to September. “With the spread of entertainment offered through networks, the available means of providing games continue to diversify. Opportunities to reach an even greater audience for games are increasing. Against this background, we intend to develop ways of playing games that match the characteristics of each device. As for mobile games, we intend to release the latest title in the LOVEPLUS series, LOVEPLUS EVERY. With titles including Tokimeki Idol and Quiz Magic Academy LOST FANTARIUM, which were released during the three-month period ended March 31, 2018, we will strive to provide enjoyable content for many customers. In the Chinese market, Winning Eleven CARD COLLECTION as well as Winning Eleven 2018, which surpassed 100 million downloads worldwide, are intended to be released through collaboration with local companies. In addition to them, we will strive to provide contents that enables us to deliver pleasure to customers in various ages and regions, including Yu-Gi-Oh! DUEL LINKS which surpassed 65 million downloads worldwide. As for computer and video games, we released JIKKYOU PAWAFURU PUROYAKYU 2018 in April 2018, which is to receive favorable reviews with its new features including VR compatibility. In June 2018, we intend to release SUPER BOMBERMAN R for PlayStation4, Xbox One, and Steam (PC) in order to enable more customers to have fun. In addition, we are eagerly working on ANUBIS ZONE OF THE ENDERS:M∀RS, which was exhibited at Tokyo Game Show 2017, with intended to be released in September 2018. Furthermore, we will also strive to provide opportunities for our customers to continue having fun with Winning Eleven 2018 (known overseas as PRO EVOLUTION SOCCER 2018), including hosting the final match at the eSports Global Championship “PES LEAGUE WORLD TOUR 2018” this summer. All in all, those are certainly strong results.